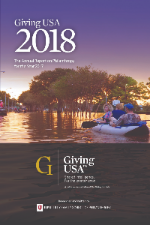 We’re approaching that most wonderful time of the year: Giving USA 2018: The Annual Report on Philanthropy for the Year 2017 is on the horizon. We’re ready to welcome Dr. Patrick Rooney back to Kansas City as he gives us that coveted first look at giving data for 2017 and provides critical observations and interpretations about the state of philanthropy in the U.S. This will be our 13th year of presenting the report with Dr. Rooney in Kansas City, and I am proud of our partnership and friendship with this nationally-recognized (and fun!) expert on philanthropy. It’s no secret I’m a fundraising “nerd,” and so many questions come to mind as I eagerly anticipate the release of our most trusted and comprehensive annual giving report: Will charitable giving rise for the fourth straight year? How did rage giving and tax reform affect philanthropy? Will the other recipient sectors continue to close the gap on or even surpass giving to religion? How did the economy impact giving? But here’s the most important question about Giving USA to consider: How can nonprofits use the report to improve their fundraising? Don’t treat Giving USA the way some organizations treat their strategic plan and simply place the report on a shelf as you go about your daily routine. Read the report. Understand the report. Share the report. Refer back to the report. Make changes to fundraising strategies based on the report. At JB+A, everyone carries a copy of Giving USA (perhaps my good habits ARE rubbing off on others) – and we make notes, discuss the trends, identify nonprofit sector needs, successes and failures, evaluate our clients’ fundraising progress and brainstorm new strategies and tactics to improve fundraising. Remember that great American Express ad campaign, “Don’t leave home without it”? The same goes for Giving USA. The stock market, personal wealth, personal income, GDP, corporate pre-tax profits and unemployment rates impact giving by all four sources (individuals, foundations, bequests and corporations). Trends are closely monitored by people “inside” and “outside” the philanthropy sector. Be aware of changes in these indicators, anticipate how changes will impact donors and adjust fundraising strategies accordingly. Economic and political scenarios, complex societal issues, diverse giving platforms, wealth and capacity are just some of the drivers behind philanthropy. Understand the context of these drivers, help manage expectations about giving and set realistic and achievable goals for your fundraising plans. Help stakeholders better understand your organization’s funding patterns and potential. This isn’t so much about “keeping up with the Joneses of fundraising” but rather, what can we learn from their success and what can (or can’t) we emulate? Nonprofit fundraising must evolve as philanthropy evolves. We are seeing an increase in the popularity of non-traditional giving vehicles (such as donor-advised funds and non-cash assets) and donors want more evidence of the impact of their gifts. What do your donors expect? Listen to your donors and prospective donors – and tailor your strategies to match their needs and expectations. An estimated 87% of total giving in 2016 came from individuals, bequests and family foundations. There are human beings involved in every gift, and unfortunately sometimes, we forget this. Focus on developing and maintaining meaningful relationships with not simply the “concept of donor” but on an individual basis…with Bill and Marcia, with Joe and Liz, with Emma, with Peter and with Shane. One last thought: Americans give an average of more than $1 billion a day to help others. So, you can also use the report to remind yourself (and others): nonprofits are doing very important work. Good job. Be sure to register now for the 501 (c) Success National Speaker Series Giving USA 2018: The Annual Report on Philanthropy for the Year 2017 with Dr. Patrick Rooney. Details are below.